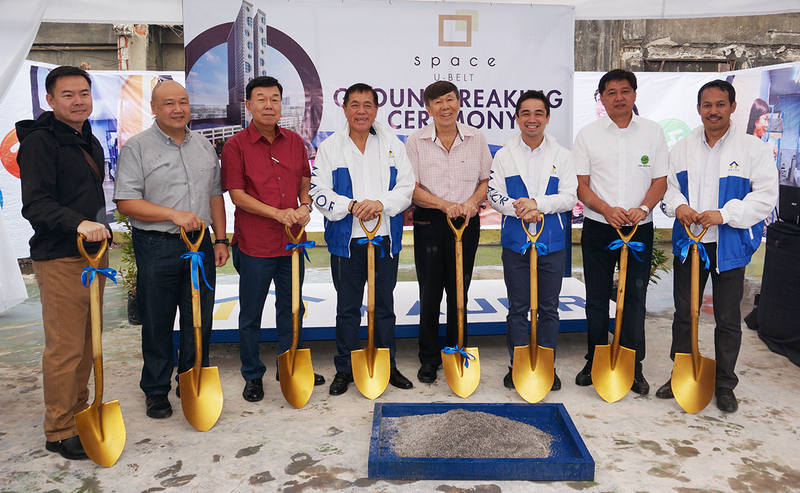 Major Homes' Space University Belt breaks ground | Major Homes Inc.
Major Homes recently held the groundbreaking for Space University Belt, a high-rise condominium-dormitory-hotel (condormitel) located along Recto Avenue. Present during the groundbreaking were (from left): Warren Yu (Senior Partner, WCY Architects), Jeff Yang (landowner), Willie Yu (Principal Architect, WCY Architects), Atty. Mario Oreta, Robert Yang (landowner), Quinto Oreta (President, Major Homes Inc.), Boyet Evanglista (President, GPI), and Engr. Roger Vinluan (Property Management Head, Major Homes Inc.). Space University Belt is a 38-storey development that offers 1,858 units which shall be fully furnished with three to five beds, a kitchen, toilet and bath, closet and study table. Units range from 14 sqm to 23 sqm. True to the condominium and hotel components of Space, its building features will include a 3-level retail area with dining, convenience stores, cinema, swimming pool, fitness gym, function hall and sky garden. Occupants’ safety is also assured at Space University Belt, as the building will have 24-hour security and will be equipped with CCTV cameras at common areas and elevator cars. Unit owners will also be provided with security key cards. Patterned after a sachet business model, units will be rented out on a per bed basis, making it an affordable option to students and professionals. Space University Belt also offers a promising business opportunity to investors looking for passive income through rental yields. “This momentous event marks the commencement of construction and is also a testament that Major Homes will remain faithful to its promise of upgrading the current dormitory experience of students,” said Major Homes president Quinto Oreta. This entry was posted in Media, Press Release. Bookmark the permalink. MAJOR is a premiere property developer with extensive construction experience that spans over 30 years. MAJOR has been involved in the development of iconic landmarks such as: Tagaytay Highlands, Sta. Elena Golf & Country Club, Mountain Ridge Tagaytay, Tagaytay South Ridge Estates, Caylabne Bay, Carmelray, & La finca. MAJOR is dedicated to providing its clients with affordable, world class, investment grade housing options. Copyright © 2013 Major Homes Inc. All Rights Reserved.